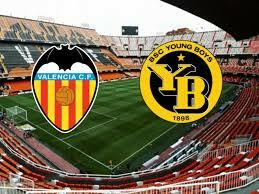 Valencia welcomes Young Boys at the Estadio Mestalla in a match from Group H of the Champions League. Valencia still have some chances to progress to the 1/8-finals of the competition, but the Spanish side really needs to win this match. Right now Los Che are 3rd in the group standings with 2 points, being just 2 points behind the 2nd Manchester United. Depending on the result between Juventus and United in the other game, Valencia could be 2nd in the group after Wednesday. Young Boys on the other hand are 4th in the group with just one point won so far. Theoretically they have a chance to progress, too, but the Swiss champions is clearly the underdog here. Being an underdog didn’t stop Young Boys from winning a point against Valencia two weeks ago. The match in Bern ended with a 1-1 draw. Michy Batshuayi opened the score for Los Che after an assist from Carlos Soler, but Hoarau equalized for Young Boys after a well executed penalty kick soon after the start of the second half. This was really disapointing for Valencia, because the Spanish side hoped to record a first win in the competition for this season. If they had won, right now Valencia would have been with the same amount as points as Manchester United. As for Young Boys, they probably understand very well their role of an underdog in this group. For the Swiss team every point in this competition is prestigious. On the other hand, Young Boys are probably still hoping to finish at least 3rd in the group and continue in Europa League. But in order to do this, they need to start winning games. These are our thoughts about the Champions League clash between Valencia and Young Boys at the Estadio Mestalla.